Since the late 1890s, scientists at the [New York State Agricultural Experiment Station in Geneva] have painstakingly developed 66 new apple varieties. It’s the nation’s oldest and largest apple development program. 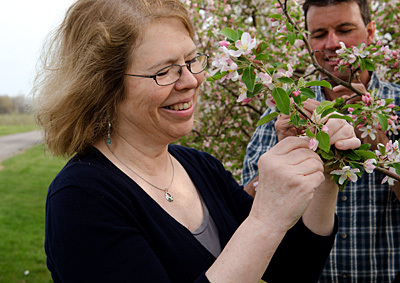 Susan Brown, an associate dean at Cornell’s College of Agriculture and Life Sciences, who oversees the Geneva apple program, is the mastermind pulling the genetic strings. She is responsible for developing new apple varieties, and does everything from picking the apple’s parents to tasting apples and releasing the new apple trees. “I choose which apple is the mother or father, and then I breed them,” Brown said. “It’s like shuffling cards, and then you pick and choose which varieties you want. 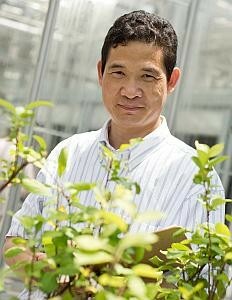 Read the whole article: Mother of apple invention: Meet the woman, research center behind NY’s newest apples. Trent Preszler, M.S. 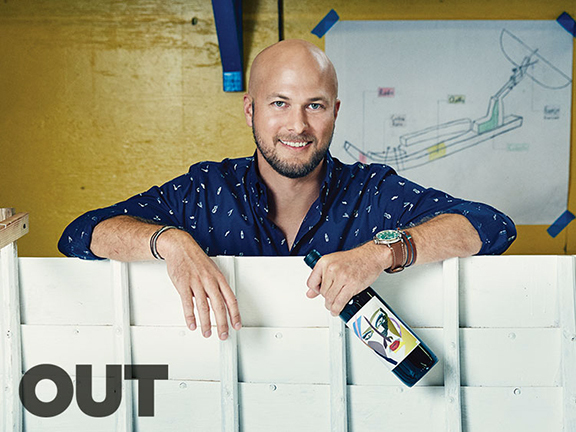 ’02, Ph.D. ’12, a winemaker and boat builder, has been named one of Out Magazine’s Top 10 Tastemakers for 2015. The magazine writes: “It’s not surprising that a kid who grew up on a cattle ranch in South Dakota would himself end up working in the fields, but Preszler’s journey to a Long Island winery turned on a simple choice he made as a student. Invited to decide between two research grants at Cornell, one to examine Holland’s flower industry, and the other to analyze the market for New York wines, Preszler chose the latter. The result was a 300-page master’s thesis that won him an award from Cornell and a job offer from Bedell Cellars, where Preszler quickly put his insights into practice. Dilmun Hill — recently named one of the Top 10 College Farms in the U.S. — is looking for students to join our steering committee. We are a student-run farm that has been practicing sustainable agriculture on Cornell’s campus since 1996. Our community is the backbone of the farm – it makes it all work, and it makes it fun. Running a student farm is as much about organizing, budgeting, and growing vegetables as it is about working jointly as a team. 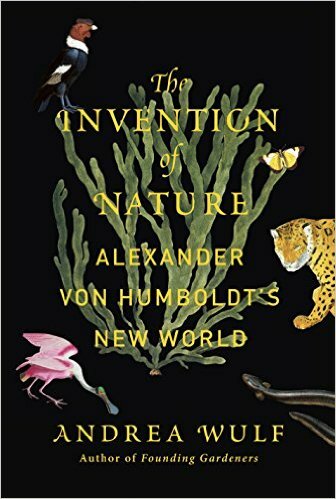 The Invention of Nature reveals the extraordinary life of the visionary German naturalist Alexander von Humboldt (1769-1859) and how he created the way we understand nature today. Though almost forgotten today, his name lingers everywhere from the Humboldt Current to the Humboldt penguin. Humboldt was an intrepid explorer and the most famous scientist of his age. His restless life was packed with adventure and discovery, whether climbing the highest volcanoes in the world, paddling down the Orinoco or racing through anthrax–infested Siberia. Perceiving nature as an interconnected global force, Humboldt discovered similarities between climate zones across the world and predicted human-induced climate change. He turned scientific observation into poetic narrative, and his writings inspired naturalists and poets such as Darwin, Wordsworth and Goethe but also politicians such as Jefferson. Wulf also argues that it was Humboldt’s influence that led John Muir to his ideas of preservation and that shaped Thoreau’s ‘Walden’. Wulf traces Humboldt’s influences through the great minds he inspired in revolution, evolution, ecology, conservation, art and literature. In The Invention of Nature, Wulf brings this lost hero to science and the forgotten father of environmentalism back to life. Agriculture and Adaptation – Profiles New York producers (dairy, apple, grape, CSA) and how they are adjusting their management to a changing climate. Farming for Energy – Features two New York producers who have reduced their energy costs and carbon footprint: A dairy producer who constructed a methane digester and an apple orchardist who is powering his operation with electricity from wind and solar. The videos were produced by James Monahan/ConservationBridge in collaboration with the Cornell Institute for Climate Change and Agriculture (CICCA) under project director James Lassoie in Cornell’s Department of Natural Resources. Additional support provided by the Northwest New York Dairy, Livestock and Field Crops Team, the Lake Ontario Fruit Program, CCE Dutchess County, the Cornell Vegetable Program, Cornell Dairy and Environmental Systems Group, and Habitat Seven. Funding for this project provided by Federal Formula Fund Smith-Lever grant #1477656. If you missed Wednesday’s Graduate Field of Horticulture exit seminar, Potato (Solanum tuberosum L.) in Ethiopia: Variety Diversity, Attributes and Farmers’ Needs, with with PhD candidate Semagn-Asredie Kolech, it’s available online. 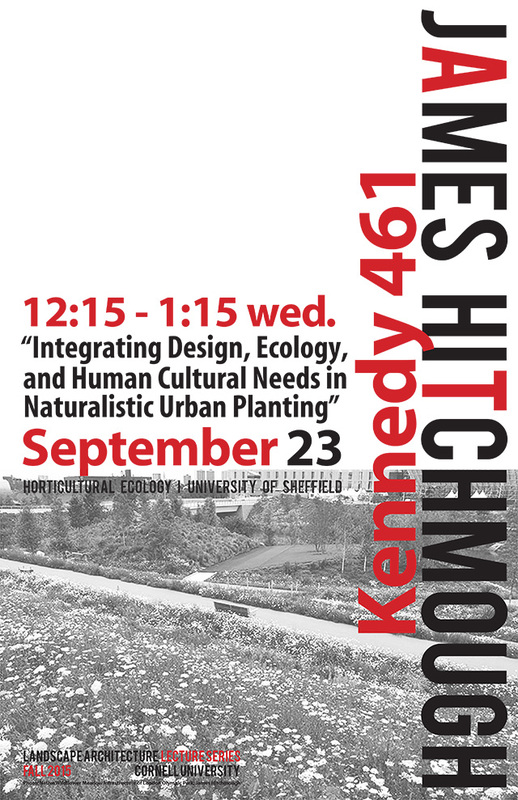 If you missed Monday’s Horticulture Section seminar, Agricultural resiliency: A human aspect of production agriculture , with Jeff Perry, senior lecturer, Horticulture Section, it’s available online. Webinars are open to all. We hope we are joined by youth, classrooms, educators, volunteers, gardeners, growers and other interested citizens from throughout our communities. Turn to your favorite news outlet and chances are you will hear biotechnology mentioned. Just what is biotech? Have you ever eaten genetically engineered food? How will biotechnology affect the environment? In this three-part webinar series a panel of six university researchers share perspectives about the application of biotechnology in our food production systems. Each session will end with an audience Q & A. Join our conversations. Be inspired to move beyond denial or unquestioning acceptance to meaningfully participate in discussions where science is key source of knowledge in decision-making. This series of webinars is organized by Lori Brewer and Kenong Xu with funding support from an NSF-Plant Genome Research Program grant award (IOS-1339211). 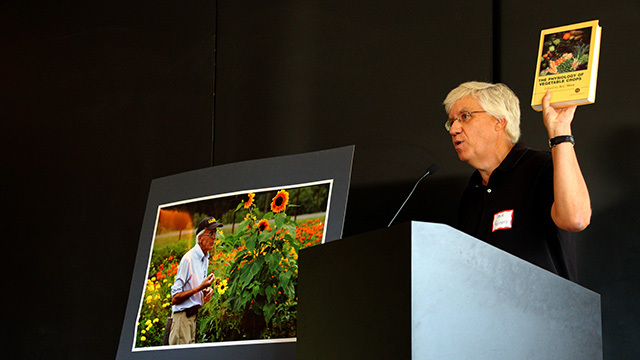 Colleagues and co-workers, friends and family, and students new and old gathered Friday to pay tribute to Horticulture professor Chris Wien as he prepares for retirement this fall. 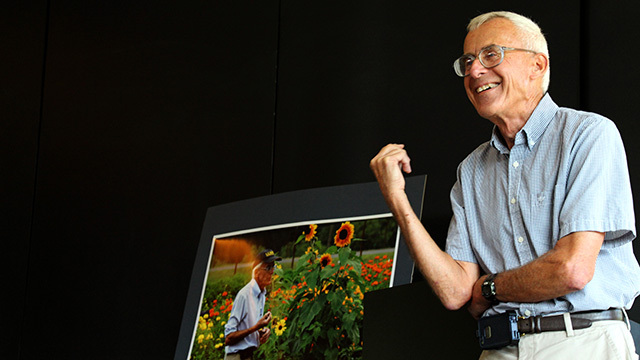 Wien, who ‘wrote the book’ on The Physiology of Vegetable Crops, came to Cornell in the ’60s after completing his BS at at The University of Toronto in Guelph, Ontario. He received his PhD in Vegetable Crops from Cornell in 1971, and returned as assistant professor in 1979 after working abroad as a research scientist studying grain legume physiology in Nigeria. He served as department chair from 1996 through 2002. In additon to his vegetable physiology work, Wien has researched cut flower production, led outreach projects encouraging the use of high tunnels among both growers and in school gardens, and continued his international work in Africa, working with smallholder horticulturists in Zimbabwe. 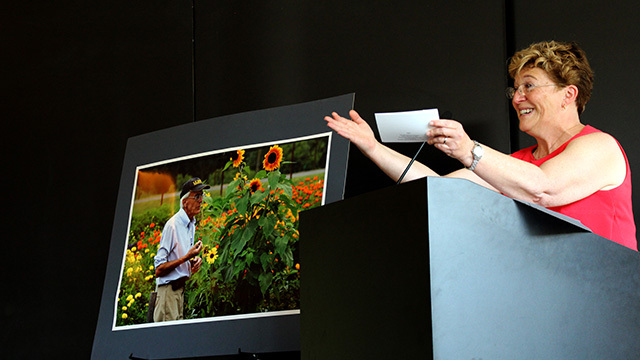 One highlight of the tribute came when Dean Kathryn Boor revealed that Wien is the anonymous donor whose generosity established the Cornell Assistantship for Horticulture in Africa (CAHA), which provides doctoral assistantships in the Graduate Field of Horticulture to students from Sub-Saharan Africa. Charles Wasonga (PhD ’10) was the first CAHA student to earn a doctorate. The second, Semagn Kolech, is finishing his doctorate this fall, and a third CAHA recipient will begin studies at Cornell in 2016. Congratulations, Chris. You’ve set a high bar for professionalism, caring and generosity. We will strive to live up to your example and wish you well in retirement. Dean Kathryn Boor thanked Wien for his service and generosity — especially for his role in establishing of the Cornell Assistantship for Horticulture in Africa (CAHA). 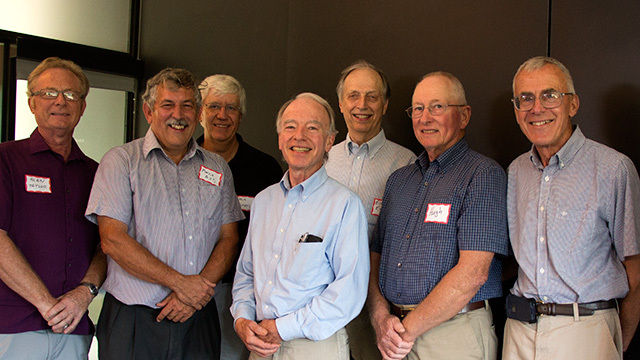 Six former and current chairs helped celebrate Wien’s career (left to right): Alan Taylor (Horticultural Science – Geneva), Marvin Pritts (Horticulture), Steve Reiners (current chair, Horticulture Section), Tom Weiler (Floriculture and Ornamental Horticulture), Elmer Ewing (Vegetable Crops, Fruit and Vegetable Science), Hugh Price (Horticultural Science – Geneva), Chris Wien (Fruit and Vegetable Science, Horticulture). Horticulture Section chair Steve Reiners and others noted that Wien ‘wrote the book’ on vegetable crop physiology.